An event town accessible only during the month of December, Happyville is a snowy town just outside of Ellinia. Despite its location on Victoria Island, Happyville is accessible via Rooney in El Nath, Ellinia, Henesys, Leafre (MapleSEA only), New Leaf City, Mu Lung, Orbis, Golden Temple and Ludibrium as well. At EuropeMS, you can access only from Ellinia. To access Happyville via Rooney, one must talk to the Paperboy, an NPC located in several towns. He will hand out fliers which, when taken to Rooney, grant access. There are a few quest NPCs inside, as well as a shopkeeper selling various different colored letters and ornaments. the Snowmen in town will take you to a myriad of Christmas tree rooms for you to decorate. These rooms are unique in that items dropped here are unable to be picked up by others, and immediately return to your inventory upon departure. Also, Red Rudolph noses with various stats on them are available during the holidays, via a quest involving a horn located in the cash shop. Happyville's Snow Zone. Fill the Snow Blower to summon the boss. 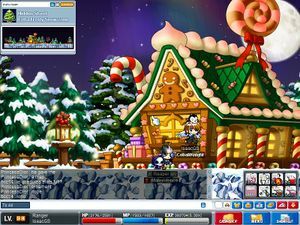 In 2007, Happyville was renovated, giving it a more festive feel. In addition to the existing NPCs, there is now Maple Claws, the female cat that delivers presents for "Maplemas." Holiday gift boxes are lying around town and, when destroyed, they drop warm mittens, which are common job claws. These mittens must be worn to access the new map, called the "Extra Frosty Snow Zone." Inside is a machine called the Snow Blower. By throwing in an item called Nevermelting Snow, an enormous Snowman boss can be summoned. Once summoned, snowballs begin raining from the sky. These snowballs can be thrown with the Warm Mittens. If one tries to unequip the warm mittens on this map, they will instantly die, similar to the Guild Quest's Protector Rocks. It takes 50,000 Nevermelting Snow to summon it, which means an effort by the entire server world's population is necessary. Now, in the year 2008, Rooney can take you to Happyville for free and there is also a Christmas Party Quest that you can do in Happyville, along with bunches of other quests. Happyville also has a Transformation Party in which you have to use a transformation potion to get in. 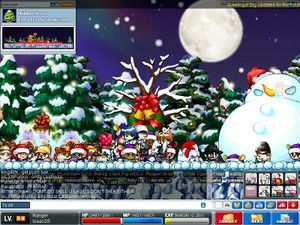 In ChinaMS, TaiwanMS and MapleSEA, you need to kill the NooNoo Snowman before you access into Happyville and in the Happyville you find different Quests. Rooney can return players to their town of origin for free once they're through here. This page was last edited on 23 February 2014, at 05:59.